If breadcrumbs have not been prepared, half hamburger buns and then toast in a low temperature oven (200 degrees F) until slightly golden brown and firm. Cool before preparing crumbs. Break bread into pieces and place in food processor or appropriate grinder. Process bread until desired crumb size is obtained. See recipe MRS 1303, Whole Wheat Bread Crumbs, for detailed directions and photographs of this recipe. Cook elbow macaroni in steam-jacketed kettle until al-dente (cooked just long enough to be still firm, and not too soft), according to directions on the package (about 9 to 11 minutes). DO NOT OVERCOOK. Drain off water. Melt margarine in a stock pot or steam-jacketed kettle. Combine flour, salt, dry mustard, white pepper, and parsley in a bowl. Add to the melted margarine. Cook this for 2 minutes over medium heat, stirring continuously. Do not brown. Heat milk in a stockpot to a simmer, then slowly add milk to the flour mixture, stirring continuously. Cook until smooth and thick. Add Worcestershire sauce, shredded American cheese, and 8 ounces of Parmesan cheese to the white sauce. Stir over low heat until cheese melts. Combine well-drained macaroni with sauce and mix well. Place 10 pounds 6 ounces into each steamtable pan (12" x 20" x 2½"). Cover with a lid or aluminum foil. Conventional oven: 350 degrees F, 30 minutes. Convection oven: 325 degrees F, 25 minutes. Combine the bread crumbs and shredded 2 pounds parmesan cheese in a bowl. Sprinkle 3 cups over each pan of baked macaroni. Bake an additional 5 minutes, uncovered, until lightly browned. CCP: Internal temperature must reach 140 degrees F or higher for 15 seconds. Slice ham and heat to 165 degrees F. Weigh a 1½ ounce of portion of ham to determine portion size. 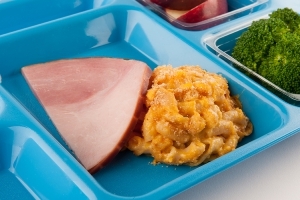 Portion #6 scoop of macaroni and cheese and 1½ ounce ham per serving. Each portion provides 2 oz. eq. meat/meat alternate and 1 oz. eq. enriched grain. "Culinary Techniques for Healthy School Meals: Preparing Meats" provides seasoning and serving ideas for entrées. Yield: 100 servings: 100 servings of macaroni and cheese requires 4 full-size steam table pans.